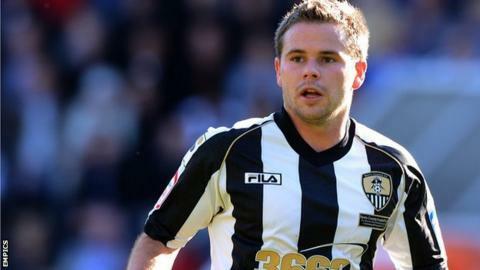 Notts County midfielder Alan Judge says he is fed up with the constant turnover of managers at the club following Keith Curle's sacking earlier this month. "I am just sick of it now," Judge told BBC Radio Nottingham. "I have only been here two and a half seasons and that is my sixth manager. "I don't know what is happening to the stability they want to have. They have to stick with it. "Eventually they have to stick with the manager. They cannot keep doing it." Curle was in charge for less than a year and left Meadow Lane with the Magpies 10th in League One and five points from a play-off position. First-team coaches Colin Lee and Colin West also left the club and Chris Kiwomya is now in caretaker charge. Chairman Ray Trew said a combination of poor performances and falling attendances were behind the decision to change manager. But captain Neal Bishop told BBC Radio Nottingham he backed Judge in the call for stability. "In three and a half years I have seen off 10 managers," Bishop said. "We were in an indifferent run of form but overall we felt we were on the right track. The players are all disappointed. "We could see we had had the right man in charge. Some people had said the manager was too close to the players but that's a load of rubbish; he was hard but fair. "I have seen Judgey's comments and I fully support him. But we are professionals and we have to get on with on it." Judge, who is out of contract in the summer and seems likely to leave, said the club is crying out for stability. "I know some of the fans weren't happy," Judge said. "It's maybe 20 or 30 fans who have complained and they have got their wish and got the manager sacked and that shouldn't be happening. "I don't think they understood the great work he was doing behind the scenes here and how he put the staff together and things like that. "He was doing great work and, as Colin Lee said, we were three quarters of the way through. We just needed a couple of new strikers. I think we jumped the gun." Lee told BBC Radio Nottingham the sacking came as a huge surprise as the management team were convinced they were doing a good job. He said: "We were trying to implement a style of play which I think we have achieved and when you look at the stats, in 49 league games we have only lost 11 games and that stat stands up to anything. "We felt we were three quarters of a way through a job. I think we were two or three players away from being a really good team. "We tried to cover those positions. It was blatantly obvious to everyone that the strikeforce was not good enough and we knew that. "We knew what we wanted but they were the final pieces of the jigsaw and unfortunately we won't get the opportunity to put them in. That's the disappointing thing. "Not being able to complete the job is a big disappointment. It's such a shame that we cannot see it through."